Later this week a seminar is being held in Wellington to celebrate 100 years since the formation of the ANC (African National Congress) and to also look at the history of the anti-apartheid movement under the heading ‘How New Zealand helped to abolish apartheid’. Several Wellingtonians active in the anti-apartheid struggle have organised the event where the keynote address will be given by former ANC Cabinet Minister Arnold Stofile. Several people have asked me if I will be attending or alternatively why I won’t be attending so for the record I’m reprinting here the emails I sent declining the invitation. Thanks for the note. I’ve given it some serious thought and have decided to decline the offer to take part. I don’t think the programme can have real credibility as it stands unless in some way it addresses what has occurred in South Africa in the 18 years since the ANC was elected to power. I, and most people in the anti-apartheid movement in New Zealand, took part in the boycott campaigns not to simply change the colour of the faces of those who ruled South Africa. We didn’t face batons and barbed wire to replace race-based apartheid with economic apartheid. Our intention wasn’t to stop the apartheid gravy train for the wealthy just long enough for a tiny number of the black elite to jump on. I appreciate the seminar is about New Zealand’s role in the struggle to see the end of race-based apartheid but it seems designed to avoid the uncomfortable questions about what the ANC has done with its democratic mandate which our actions here were designed to help bring about. The seminar should be prepared to hear from the many organisations fighting for decent housing and jobs etc in South Africa but who now suffer harassment and hounding by the ANC In short I think the seminar needs to have some serious critique of the ANC’s neo-liberal economic policies which are enriching the few at the expense of the many just as they have done in New Zealand for the past generation under successive Labour and National led governments. Without this I think the seminar will be just an exercise in nostalgia. Thanks for the note. Sorry for the late response but things have been hectic this week. _____ wrote and asked me to speak on one of the panels which was the first I’d heard of the event. I replied that I wouldn’t speak and for the same reason as I explained to her I won’t be coming either. For a number of reasons I don’t think it’s helpful to tie an event to mark the ANC Centenary with an event to examine the history of the New Zealand anti-apartheid movement. For example the movement in the earlier decades under discussion offered much broader support to the liberation struggle that to just the ANC. But my greatest concern is the failure of the seminar to look at what the ANC has done in the last 18 years of that centenary – namely when it has been in power in South Africa. You will know what I mean. The voices we should be bringing to New Zealand (as we did last year for the 30th anniversary of the Springbok Tour) are those such as S’Bu Zikode from Abahlali baseMjondolo who speaks for a large group of the dispossessed in South Africa and whose movement has suffered violent attacks and killings at the hands of young ANC activists. “All is slowly sinking as the new government is making sure that we remember the heroes of the struggle but not what the struggle was for”. My concern is the seminar is precisely reflecting that view rather than the much more arguable view that the ANC has betrayed the struggle of the people of South Africa. The seminar looks more like an exercise in nostalgia than an honest appraisal of the ANC then and now. This is not intended as an attack on the people taking part in the seminar, many of whom I have great respect for. It’s unfortunate I didn’t have the opportunity to comment on the proposal before it was set in concrete as I would have put forward these views then and perhaps the seminar could have been associated with a much more robust analysis of ANC history. Education Minister Hekia Parata’s comment that she was once in a class of 43 students will resonate with older New Zealanders. Large classes were the norm in the 1950’s and 60’s and I have a class photo showing 57 alongside me at primary school in South Dunedin. But classrooms have changed dramatically in the intervening generations. In the past most teaching was done as “chalk and talk” from the front of the room and kids assessed with exams twice a year. But teachers today are expected to see their students as individuals with individual needs, learning styles and challenges and adapt their teaching accordingly. They are expected to be able to give good and frequent individual feedback on progress and feed forward what students need to be working on to develop their learning. Assessment has grown like topsy into a much larger burden and with national standards now infecting primary schools this will increase again. Changes in the teaching of children with special education needs has also impacted significantly on classrooms since 1989 when the Education Act gave children with special needs the right to enroll at their local school. This was universally welcomed but like so many good policies was never resourced for success. There is no better illustration of this than last week’s announcement that the Ministry of Education wants to close four residential schools for intellectually disabled children and those with serious behavioural difficulties and require them to access their education in mainstream schools. This mirrors the 1998 Ministry decision to withdraw direct funding from the country’s special needs units attached to mainstream schools and require the children to enter mainstream classrooms unless their school or local cluster of schools could fund a unit themselves. Many schools and parents put up valiant struggles but the massive financial leverage of the Ministry means the small number of remaining units are facing forced closure at the end of this year. These changes are fraught for teachers because the resources and the smaller class sizes are just not there for this to be a successful strategy in many cases. One of my most dispiriting experiences in education was some years back when a meeting of several thousand secondary school teachers loudly applauded a speaker who was struggling to support children with special education needs he was required to teach in his mainstream classroom. He was supportive of mainstreaming but frustrated at his inability to do the best for all the kids in the class without the support needed for them all to become successful learners. Increasing class sizes makes all this that much more difficult. We already have the unsavoury behaviour of some public schools discouraging enrolment of children with special needs. God forbid that that extends to classroom teachers who will see their own reputation tarnished and their income reduced through performance pay if they welcome children with special needs into their classroom. Today’s teachers are expected to be super-teachers – to take a class of 30 or so students and deliver increasingly individualized education programmes with much more emphasis on assessment and feedback to students and parents. Instead of helping and resourcing teachers to do this job the government is making it harder. One of the ironies is that National Party government ministers seem to prefer to send their own kids to elite private schools where small classes are given priority, children with special education needs or behavioral problems are refused enrolment and rather than performance pay the teachers are paid the state school pay rates with an additional percentage. And just to make sure their kids are resourced properly the government gave them a 22.3% increase in government subsidies for 2010 with further increases since. Not so for schools in our low-income areas where student achievement is well below other areas. The issues here are multiple but the elephant in the room is our appalling low-wage economy where on top of 160,000 unemployed we have half a million people earning less than $16 an hour and over a hundred thousand who don’t get enough hours of work to enjoy a decent income. But despite the now frequent attacks on teachers and schools New Zealand has a good public education system which consistently ranks third or fourth in the world in international achievement comparisons. If only our athletes in London could do so well. The Green Party last week produced an excellent analysis of who has benefited and who has paid the price after four years of National/Act/Maori Party government. Anyone who has followed political decision making under National will not find anything surprising but it’s refreshing to see the impact of National’s polices so starkly presented. The wealthy are creaming it while those on middle and low incomes are much worse off. A solo mother working hard to become an independent earner is a heavy loser. Her training incentive allowance was cut by Social Development Minister Paula Benefit meaning her struggle to get off a benefit got a lot harder. She is $5,740 worse off on an income of $32,500. 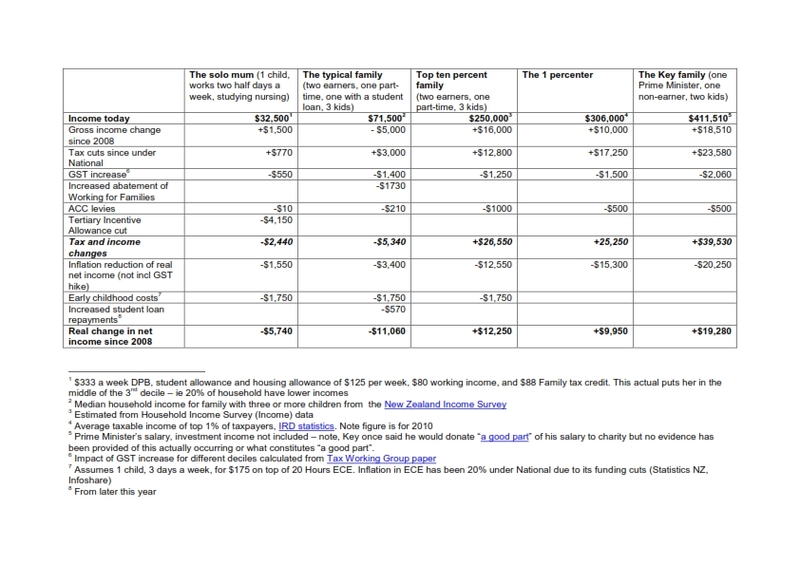 The “typical family” is also a heavy loser coming out $11,060 worse off on an income of $71,500. The big winners are the wealthy. Those in the top 10% of income earners are hugely better off and the further up the pinnacle the better it gets. John Key himself has personally gained an extra $19,280 from his Prime Ministerial income alone. The analysis doesn’t give the full picture however. As the Greens point out 20% of households are earning even less than the solo mother while at the other end the incomes are further inflated from “investments” which are unearned and untaxed. Freebies for the rich. And the impact of the increase in GST to 15% is also not factored into the analysis. The budget has made things worse. Increased prescription charges, larger class sizes, less access to student allowances etc will all help grow the gap between rich and poor. Like the farm animals in George Orwell’s Animal Farm looking through the farmhouse windows at the luxury living of the pigs at the expense of everyone else we can see that under National “all New Zealanders are equal, but some are more equal than others”. The budget changes to student loans and allowances foreshadowed by Tertiary Education Minister Stephen Joyce reinforce the difficulties faced by students from low-income families in accessing quality tertiary education. The four-year freeze on the parental-income threshold for access to the student allowance will mean the struggle for these students gets that much tougher as inflation cuts their access to what is already a minimal payment. Similarly the refusal to extend the student allowance beyond four years makes it harder for students from low-income families to enter the longer, more expensive courses such as medicine or optometry. They will be left high and dry after four years. These students, often Maori and Pacifica students, are already on the margin in terms of representation in higher level tertiary study and the hard work done by families and schools in low-income communities to get them into high-quality tertiary education study will be further undermined with these changes. At the other end the post-graduate road is tougher as well with repayment requirements up 20% to 12% of earnings over $19,084. This will shorten repayment times but make a post-graduate experience that much more difficult. The government’s arguments for the changes don’t stack up. Yes, we are in an economic recession but the government’s priority was $2 billion in tax cuts for the top 10% of income earners two years ago with the shortfall to be picked up in this case by tertiary students from low-income families. We should be removing barriers to tertiary education for these young New Zealanders rather than adding barbed wire and broken glass to the top. Glen Innes needs our support – why? and how? Aucklanders could be forgiven for being confused as to why so many Glen Innes residents are stridently opposed to the redevelopment of their suburb. Who could object to a project which promises major upgrading of state houses, refurbished community facilities, improved education, more job opportunities, better shopping and recreational areas? It sounded great when the plans were first announced in 2008 with barely a few ripples of concern through the community. However with a change of government and more details of the project being released alongside harsh policies to reduce and sell state houses the concerns have mushroomed. So close to Anzac Day it’s worth remembering the area around Glen Innes was settled in the aftermath of the Second World War and street names reflect some of the battles where New Zealanders fought the rise of fascism. Dunkirk, Tripoli, Tobruk, Benghazi and Alamein Roads are there along with Upham and Ngarimu Roads remembering Victoria Cross winners Charles Upham and the Maori Battallion’s Moana Ngārimu. A large war memorial reserve beside the Tamaki estuary provides a reminder of the history and a place to celebrate community life after six years of war. Returning soldiers and their families moved into this community in large numbers after the war with the government providing much-needed housing. It’s an example of the best of urban development from the 1950s when state houses were spread through a community and every family could expect a decent standard of living. Generations of kids have grown up in these well-treed streets with robust houses and large sections. “There will be no requirement at all for any existing tenant in any state house to move out of the area as a result of anything that occurs here. There will be no reduction in state houses as a result of anything that occurs here”. However in the first stage of redevelopment state housing is being halved (from 156 to 78 homes) and families on low-incomes are being forced to abandon homes they have lived in for decades. By any measure these families have paid off their houses several times over but they will either be forced out of the suburb altogether or into a new high density housing area which will be an urban slum in five years. It’s small wonder the community feels betrayed and abused with previous assurances shown to be meaningless. The government’s plan has a public relations name (TTP) but in practice it’s ethnic cleansing on a grand scale. Maori and Pacific families are being forced out of their homes on the slopes of northern Glen Innes for high-income housing to take their place. It seems the government thinks families on low-incomes don’t deserve homes with a harbour view. The first state house was shifted out last week and up to 40 are scheduled to be moved in the next few weeks as the land is prepared for selling to property developers. They in turn are excited at the rich pickings they will take from buying this crown land and developing it for private profit. It’s hard to believe there is a desperate shortage of state houses. The government claims the community has been consulted widely but this is a sham. The only local person from Glen Innes on the transformation board is National MP Alfred Ngaro who believes “state housing creates dependency”. Alfred is entitled to his views but he has never been elected as a community representative of Glen Innes. The makeup of the transformation board looks as though it could happily represent Remuera but is hopelessly out of its depth in understanding the Glen Innes community. I have never seen a more patronising, unsympathetic and inarticulate response from an organisation as given by the transformation board chair to an angry community meeting in February. But these National Party appointees blunder on uprooting this community family by family, street by street. They won’t be happy until this last piece of coastal Auckland which is still occupied by low-income families is handed over to property developers to create another McMansion suburb by the sea. This is not what New Zealand soldiers fought for or, in the case of Ngarimu, died for. He was killed in 1943 and never had the opportunity to raise a family in a suburb such as Glen Innes. Looking at Glen Innes today there’s a lot to feel embarrassed about as we remember our old soldiers’ legacy. So what can we do to support this community under attack? •	Join the text alert to join protests against the movement of state houses. Text to 0211239252 to get the alerts. •	Come to the community forum on Wednesday 9th May at Grace International Church (off Line Road, GI) at 7pm where the community will speak out with a plan to deal with the crisis. It’s not often one sees an employer acting with such commercial irrationality as the Ports of Auckland. Most employers are conservative with the earnings they make from their workers and company managers strive to return the biggest dividends possible to their shareholders. They keep the business working at maximum production for the maximum time possible to achieve this while paying their workers the minimum they think they can get away with. But the Auckland Port Board is different. These employers are acting with rare economic rashness in their crusade to smash the union and strip the workers of employment conditions hard won over several generations. I can understand them wanting to crush the union. It’s in their DNA and it’s the stuff of wet dreams for most big employers. But economic lunacy is rarely on display as it is here. Not only has the board poured bucketloads of ratepayer money into this attack on its unionized workforce but it has slowed the port to a snail’s pace for several months with its refusal to settle a reasonable collective agreement with the union. What’s more it plans to continue in the same vein for at least the next six weeks by locking out the unionized workforce. Then even if the port company wins in the Employment Court and sacks all union members it would be many more weeks after that before it could employ and train contracted staff. So why would an employer do this and how could they get away with it? Because unlike the port workers these corporate ruffians have nothing to lose personally, have the government’s backing, the New Zealand Herald behind them and a shield provided by Auckland City Mayor Len Brown. The irony is that this Rodney Hide appointed board would not embark such a Quixotic escapade if the Port were owned by private sector shareholders. In that case the directors would see their personal economic benefit in keeping the port working continuously at maximum capacity. They would aim to negotiate improved flexibility with the union but not at the price of jeopardizing operations for months on end. By maintaining operations they would stand to gain personal financial benefit through the likes of share options and various kinds of handouts that these members of the one percent see as their entitlement. But at the port these board members don’t get the same benefits because there are no shares or share options and bonuses will be more carefully (we’d like to hope) monitored through public ownership. With none of these greed-based incentives the Rodney Hide’s appointed board are left to indulge their union-crushing fantasies with massive public resources and no personal risk. It is this scenario which explains their obdurate, irrational thuggery towards their unionized workers. The directors will not suffer if the port loses money. Why should they worry if the port delivers a much smaller return to Auckland City? Meanwhile there will be plenty of back-slapping emails between company boardrooms urging these corporate hooligans on. But all is not well for the board. They have run a 1980’s style anti-union campaign but this is 2012 and the public aren’t buying their line that the workers are lazy, overpaid, bullies. So where is the accountability for this out-of-control board? It should come from Mayor Len Brown but he is weak and vacillating with feet of clay. Easy meat for the corporate bullies. It must therefore come from the people of Auckland acting in large numbers in support of the workforce. And once this battle is won then the board directors Richard Pearson, Graeme Scott, Andrew Bonner, Rob Campbell, Liz Coutts and Wayne Walden must be forced from their positions – along with CEO Tony Gibson. One way or another they have to go. Remember the dramatic events of October 15th 2007? Remember the co-ordinated dawn raids up and down the country; the smashing of windows and doors; the parents and kids forced to kneel at gunpoint; the lockdown of Ruatoki; the police “ninja’s” at the roadblock on the Tuhoe confiscation line; the 17 arrested activists being paraded before the courts? Remember the dramatic police media conference at lunchtime that day when they revealed with breathless excitement they had arrested home-grown terrorists and foiled terrorist plans? On the more serious charge of being a member of an organised criminal group the jury could not reach even a 10 to one majority verdict (there were 11 jurors). The firearms convictions were to be expected. The law is worded such that one must have a “lawful purpose” to even hold a gun. The onus is therefore on the person to show they have such a purpose but with the decision of each defendant not to give evidence themselves they gave these convictions to the police. Even so almost half those charges were tossed out in any case. In the normal course of police work such technical breaches of the Arms Act would have resulted in a police warning – certainly never a high court trial. The most the police could claim from this trial would be half a wooden spoon. The public have accepted from very early on that this police operation was at best a substantial overreaction to the Urewera training camps. In fact from the very first day the police case began to unravel because only a couple of pig-hunting rifles were found during the initial raids. Just think how the police would have proudly paraded for the TV cameras any arsenal of guns or Molotov cocktails if these had been found. But they found none. They didn’t exist except in the fevered imaginations of over-resourced police tasked with finding terrorists. A few weeks later the police failed to get approval from the Solicitor General to lay charges under the Terrorism Suppression Act. The evidence didn’t justify such charges. Then most of the evidence the police had collected was found to have been illegally gathered anyway and rendered inadmissible in court on the arms charges. Most of the prosecutions had to be abandoned so with the whole case under threat the police introduced a new charge against five defendants – being a member of an organised criminal group – and then successfully argued at the Supreme Court that because this was such a serious charge it justified allowing them to use their illegally obtained evidence on the arms charges as well. So it’s ironic that the convictions on the arms charges resulted from illegally obtained evidence while the jury did not convict on the more serious charge which was used to justify the police introducing their illegal evidence in the first place. Having so comprehensively failed at each key point in the case the police nevertheless stooped, in a particularly nasty and vindictive move at the end of the trial, to oppose bail for the four defendants. Another fail. For the past four years this case has been not about terrorism or keeping the public safe but about how the police can salvage something from the wreckage of their blind misjudgement. If they do decide to prosecute again on the main charge then it will be to continue to try and save some face from this so public debacle. The best advice is the oldest advice – when you’re in a hole – stop digging. It’s important to remember that we have before parliament right now another piece of legislation to extend the powers of police and state agencies to search and spy on New Zealanders. Make no mistake – political activists will be the target as they were in this case. The best outcome of this shambles would be a sceptical, critical public which refuses to give up important freedoms to a state which has the capacity to abuse them so appallingly. The government should abandon its Search and Surveillance Bill.